SPY rose by 4.0% this week, while my account fell 0.3%. My loss-floor rose because I am out of the market again. TZA: Sold for 0.2% less than last Friday’s estimate, but account value went down by 0.3% for the week. Some sort of round-off error. TZA: Sold Tuesday using the "Alternate sell rule”. Spent the rest of Tuesday cursing that damned rule. Wednesday morning the market jumped, so would have sold TZA for a loss at the 10am stop-update. Hooray for the alternate sell rule! As of Friday’s close, PEAKFREQ(140,8) = 7, so the SRTY model is disabled but the other models remain on duty, waiting for “buy” signals. On Thursday, PEAKFREQ got down to 6, so I tried to recreate the previous histogram which showed only two hours of the last 7,000 that had such a low value. But the numbers are all different on my re-creation! Something went wrong last time. Here is the revised chart, showing 6,895 hours from February 2008 through December 2011. 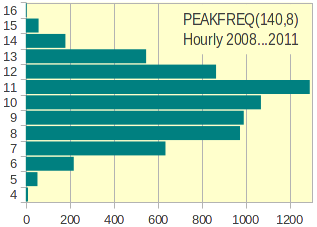 There were only 10 hours during 2008..2011 where PEAKFREQ=4 and only 4 hours with PEAKFREQ=16. 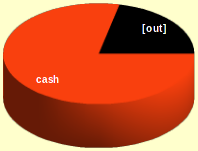 About 13% of all hours have PEAKFREQ<8 (which blocks purchases of SRTY), while 24% of all hours have PEAKFREQ>11 (which blocks TNA and TZA).